the staff were very helpful and good behavior. the parking space in front of resort made it easy for pickup and drop off. Very nice place, close to the market. The staff is nice. We asked to change the room they assigned for us, I did not like the view and the allow us to choose a room we liked. They let us keep our backpack for almost 10 days and they lend us a helmet we needed, so we went for adventure. Very nice, breakfast very good !!! Loui the concierge! That fella saved the day so many times. He will do well. Decorations were nice too. very clean and totally kind staff. Especially Dwipa (Lui) made our stay absolutely comfortable. He was always attentively and tried to make everything luxury as much as possible. Would definitely recommend this location. Good price, nice pool area and proper good breakfast. 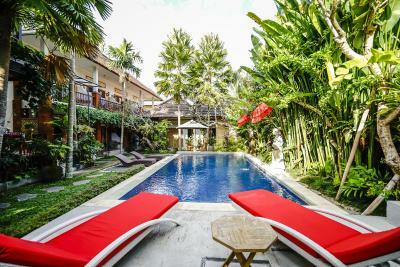 Bisma Sari Resort This rating is a reflection of how the property compares to the industry standard when it comes to price, facilities and services available. It's based on a self-evaluation by the property. Use this rating to help choose your stay! 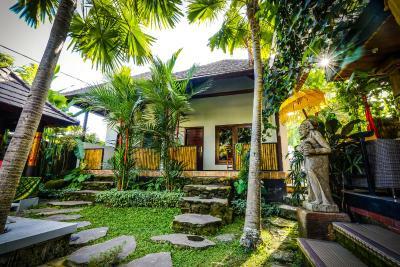 Set amid the green stretches of rice fields, Bisma Sari Resort offers a peaceful retreat 10 minutes’ walk away from Ubud Palace. 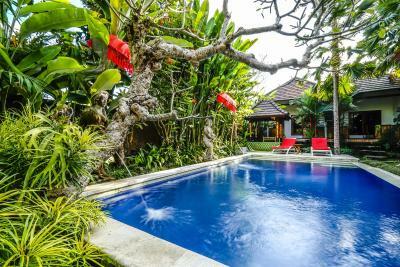 It features an outdoor pool surrounded by landscaped tropical gardens. Wi-Fi is accessible for free in all areas. 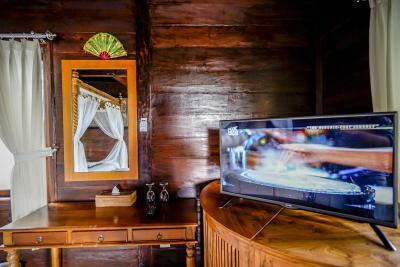 Bright and airy, rooms in Bima Sari Resort are fitted with air conditioning and classic wooden furniture. Equipped with a flat-screen TV, each room has either a balcony or a terrace. Private bathrooms provide both shower and bath facilities as well as free toiletries. 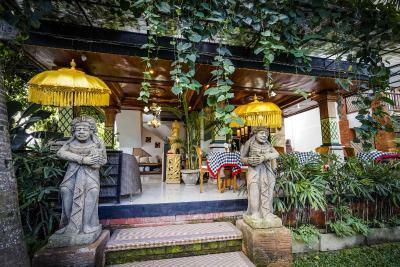 A 15-minute car ride from the property leads to Ubud Monkey Forest, while it takes an hour to drive to Ngurah Rai International Airport. Airport transfers and shuttle services are available at a charge. Guests can store luggage at the 24-hour front desk. Other on-site conveniences include laundry, dry cleaning and massage services. Additionally, free parking spaces are provided. 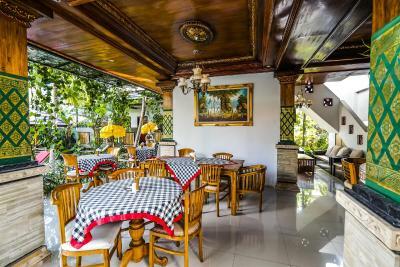 A variety of Indonesian and international dishes are served at Bisma Sari Restaurant. Alternatively, in-room dining options are offered upon request. Guests can also enjoy refreshing drinks at the resort’s bar. 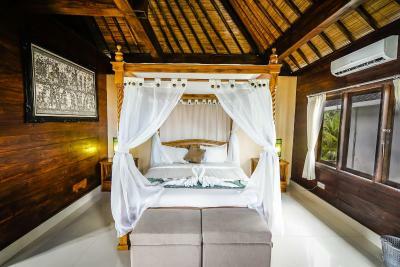 When would you like to stay at Bisma Sari Resort? 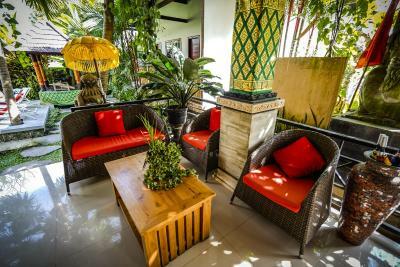 This room features air conditioning, flat-screen TV and a private terrace or balcony overlooking the pool and rice fields. 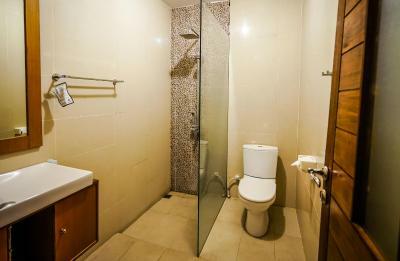 A bathtub, shower and toiletries are available in the private bathroom. 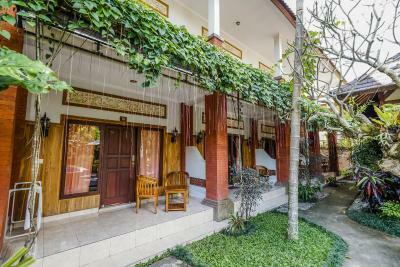 Overlooking the pool, this spacious and airy double room features a balcony, DVD player and flat-screen satellite TV. 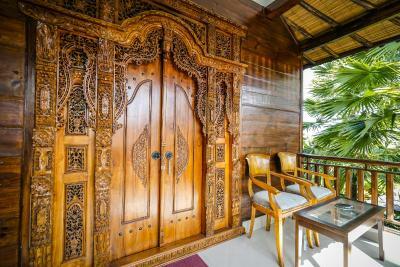 Equipped with teak furniture, refrigerator and private bathroom. 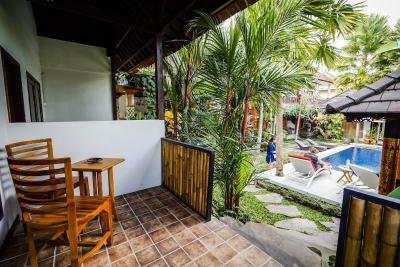 This bungalow has a balcony, air conditioning and bathrobe. 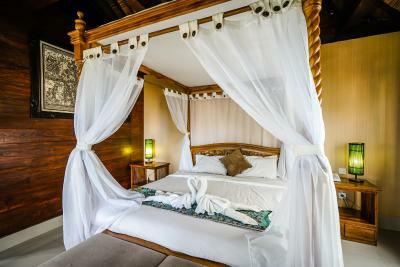 House Rules Bisma Sari Resort takes special requests – add in the next step! Any additional children or adults are charged IDR 125000 per night for extra beds. 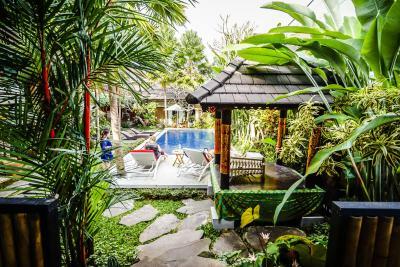 Bisma Sari Resort accepts these cards and reserves the right to temporarily hold an amount prior to arrival. Please note that the property requires a deposit payment. The staff will contact guests directly for payment instructions. Room was damp and not as advertised (no view of rice terraces, cold shower). Pool looked radioactive and was out of use for part of our stay. Staff spoke little English and repeatedly asked for payment despite us having paid in full online prior to our arrival. Walls are paper thin. 15 minute walk to central Ubud. When i was taking a shower, a rat! came from the sink cabinet walking into the shower !! Overall the room was verry dirty, dirty towels and had a big mold spot on the ceiling. There was a verry strong mold smell in the room. 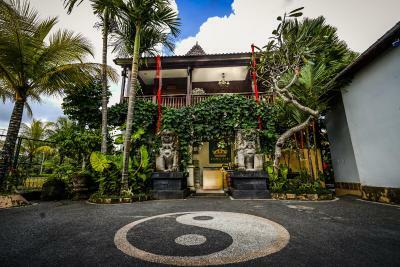 For other travelers in Ubud, even for the 18 euro, dont make this mistake! Breakfast choices was boring and limited. Took too long to prepare meal. Staff was welcoming and bed was done every night. Booking mixup. No hot water at first. Then no water at all. Room not lockable. Then a room change. Which stank of poo. Inept staff with no English, more interested in YouTube than running the resort (except for Louie). Things breaking or not working. Beds were abit uncomfortable, gap under the door where bugs could get through. One night the door lock broke so after a long day we had to wait for reception team to fix it, which was no problem at all to them just annoying when you want to go to sleep. Bathroom was filthy, bathtub full of dead flies and would not go down as plug clogged up so basically shower and your feet in a bath of dead bugs. I wasted over 30 minutes trying to get the WiFi working with a member of staff who (it turns out) simply didn't know the password nor speak enough English to communicate that. When I finally got it working the next morning (password provided by another guest) it didn't actually work in the room - and the reception area is very mosquito ridden due to stagnant water on the property. The room was clean and the Air Con quiet and bedding comfy. The staff gave a partial refund due to the problems with the WiFi. 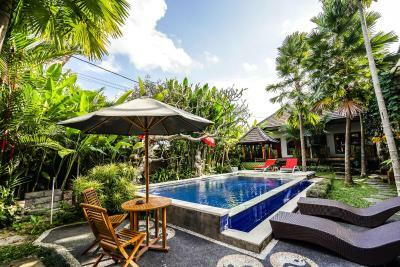 Very helpful staff, good pool and pretty close to main market.